Here’s another fabulous meatless meal! 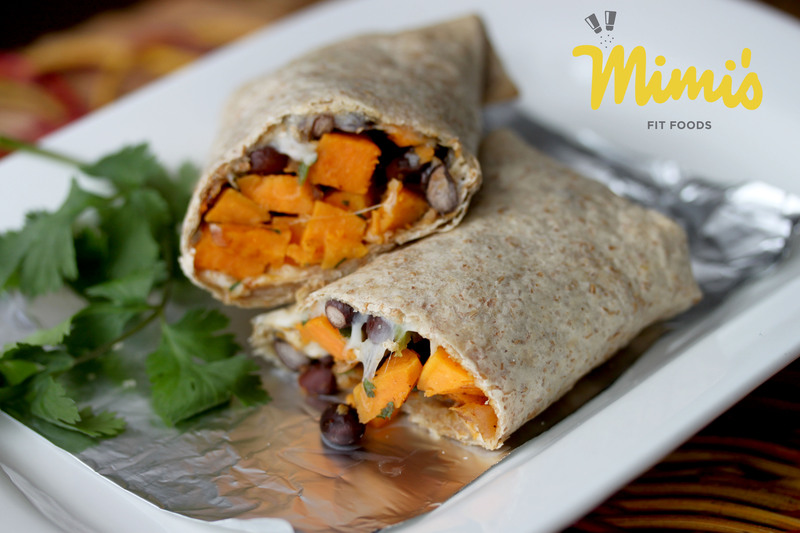 We get some nice protein from those healthy black beans and lots of other good nutrients from the sweet potatoes. Black beans and sweet potatoes are such a lovely combination. Mix them with some Mexican spices, throw in some fresh cilantro . . . and, we’ve got ourselves a winner! I love how fast this recipe comes together. And, a HUGE bonus is that you can leave the leftover filling in your fridge to whip up a burrito whenever your heart desires. This has come in handy for lunches as well as lazy and/or busy nights when dinner is pretty much not gonna happen! I wasn’t so sure that my little person would eat this in burrito form, so I mashed a portion of the filling and made a quesadilla for her. I threw it in the oven with the burritos, cooked it for the same amount of time, and that worked like a charm. She found her little quesadilla to be quite yummy. These have easily jumped high up on my list for go-to dinners and will easily make the dinner/lunch rotation often. These would also be great with the addition of cooked chicken and there’s no doubt that I’ll be adding it from time-to-time. Preheat the oven to 425 degrees F. In a large bowl, toss together the sweet potatoes, jalapeño, red pepper and red onion with the olive oil, cumin, chili powder, salt and pepper. Dump the coated veggies onto a large rimmed baking sheet and roast for 18-20 minutes, tossing halfway through. The vegetables should be tender but not mushy at the end of cooking time. Let the vegetable mixture cool. Scrape the mixture into a large bowl and toss with the black beans, cilantro and lime juice. Taste the mixture and add additional salt and pepper to taste, if needed. Refrigerate the mixture until ready to assemble the burritos or use immediately. Place 3-4 tortillas on a microwave-safe plat and cover with a damp paper towel. Microwave for 15-20 seconds until the tortillas are pliable. Place 2/3 cup or so of the vegetable mixture in the center of the tortilla and top with 1 tablespoon of shredded cheese. Fold in the sides of the tortilla and roll up. Place seam-side down on a baking sheet. Repeat with the remaining tortillas until you have all the burritos you need (the filling can be refrigerated and used for 3-4 days). Bake in a 375 degree F oven for about 10-15 minutes, until heated through and the top of the tortilla is golden brown. Adjust the baking time as needed depending on if the filling has been refrigerated or not. For a softer tortilla, wrap each burrito in tin foil and heat through. Serve immediately.